Finding a bag in the $300 to $600 range that is on-trend but not fleetingly trendy has become increasing difficult (when did it start being OK to charge quadruple digit prices for fabric bags? ), which is why designer Dareen Hakim immediately caught my attention. Her handbag styles are fashionable without looking like they'll feel dated in a season or two and they're original enough to stand out, but not so out-of-the-box that you couldn't wear them on a regular basis. I'm especially fond of the designer's V Tote and Casanova. I spoke to the up-and-coming designer and former brand manager for L'Oreal Paris and Maybelline New York about how useful a Harvard MBA is, how to stand out in a cluttered brand-driven marketplace, and more. 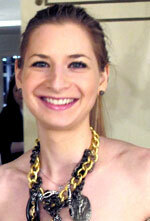 The Fashion Spot: What made you transition from the beauty to the accessories world? Dareen Hakim: Beauty and fashion go hand in hand for me. They are both about appreciating the “sense of métier” as we used to say at L’Oreal. It’s a sensibility for the art of the craft. However, the beauty corporate world tends to be much more structured and “organized” than the world of fashion, and I wanted to see how brand management and growth is done at a that level … and to take those learnings towards starting a fashion venture of my own, successfully. I started the Dareen Hakim Collection a little over a year ago, pursuing my love for accessories, creativity, and art, while incorporating my business and management background from my past experiences. tFS: Was there ever a moment you thought of giving up? What made you stick with your dream? DH: There are many challenging moments when starting your own business, but it's also those challenges, and getting over the bumps, that is so thrilling and keeps me going. Seeing the small wins, and then the bigger wins, and knowing it all stems from my personal drive, hard work, and passion for what I’m doing, is incredibly motivating. I also love my team; they make me want to wake up to their happy faces every morning and there’s really nothing more I love than hearing, reading, or seeing a smile from a customer who’s enjoyed one of my bags! It’s precious to know that I’ve touched their day in the smallest way and brought them “happiness” “laughter” or a smile, for which the world will smile back at them … as per my handbag inscriptions. tFS: Where does your inspiration come from? DH: My Lebanese heritage has always been an inspiration in both self-expression and my personal aesthetic and it is this cultural influence that’s driven by the concept of contrasts, which launched my first handbag collection. My designs are meant to incorporate this beauty of contrasts, whether in the materials, textures, shapes, colors, or bringing together the art of cultures, present and past. This creates unique and dimensional designs that make for statement pieces. tFS: What do you do when you feel stumped for new design ideas? DH: When I feel stumped, I just take a walk outside or look through pictures of my travels. I search for things that resonate with me (shapes, memories, colors..), and those somehow always tie back to my heritage because that’s what naturally sticks with me. And voila… I take it from there. Many times ideas don’t translate, but when they do, it’s a pretty great feeling! tFS: What are the biggest challenges in translating your vision on paper into an actual handbag? DH: Because I like things that are unusual and unexpected and I like contrast, often the shapes and materials I’m trying to use are not easily translated onto an accessory or easily accessible/doable. I have to find creative solutions. For example, working with hand-engraved metals has its challenge — weight, replicability, how it’s fastened, tarnishing, etc. — but that’s the fun of it all, and figuring it out results in a truly unique piece. tFS: You have an MBA from Harvard, something I’m venturing to guess very few fashion/accessories designers have. Given that so many creative people have trouble managing the business end of their brands, do you think your degree has been a key to your success? DH: I would say that my degree helps me anticipate business challenges before they happen and helps me build around them. It keeps my “antennas” peeled on factors that could arise around structure and strategy, but it certainly isn’t the secret to success, nor does it even begin to help me figure out how to balance business with creativity. Finding time to allocate to those two sides of the brain is tough, and doing so with stamina, energy, passion, and determination, while keeping your eye on what makes you different in the marketplace, is the key to success. We all have to keep striving for that perfect storm. tFS: Given that we live in such a brand-obsessed world, how have you gone about getting people to invest in one of your handbags versus one of your more established counterparts? DH: Being different. Not being afraid to try something that is totally different. Redefining what is beautiful and introducing a new element that’s never been used before and making it all work… that’s how you stand out and hope to appeal to those who understand your definition of beauty. I generally don’t hesitate to express who I am, but I am always careful to do it with grace and non-intrusively, to just share with the world in my own way. tFS: How many handbags do you own? DH: Ha! Too many to count… I’ll get back to you with a final tally in a couple months. tFS: What are the handbag styles you think every woman should own? Clutch: a stand-out piece that you know none of your friends owns and will ask you where you got it. Clutch: a pop color clutch that’s day-to-night for jeans or your little black dress. Clutch: a unique shape clutch that just makes your plain outfit chic! Clutch: a classic piece and color that you can pass down to your granddaughter… something with a little pizzazz in the leather/texture to give it longevity and strength. Should I continue? … husbands are getting upset at me right now! tFS: If we were to look inside your day-to-day handbag what would we find? DH: Wallet the size of a brick, makeup, sunglasses, receipts, gum, business cards, umbrella, band-aids, a little sunglass tool kit (!) … it just keeps getting more random. Most importantly, a picture of something that keeps me strong and positive… that brings me happiness and good luck. I believe in that.